What is today's exchange rates? 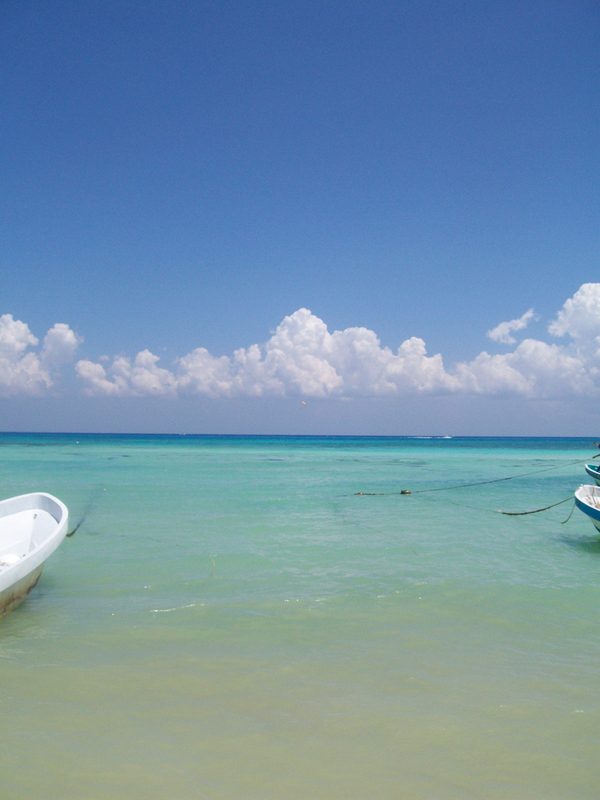 The State of Quintana Roo does not have Daylight Savings. 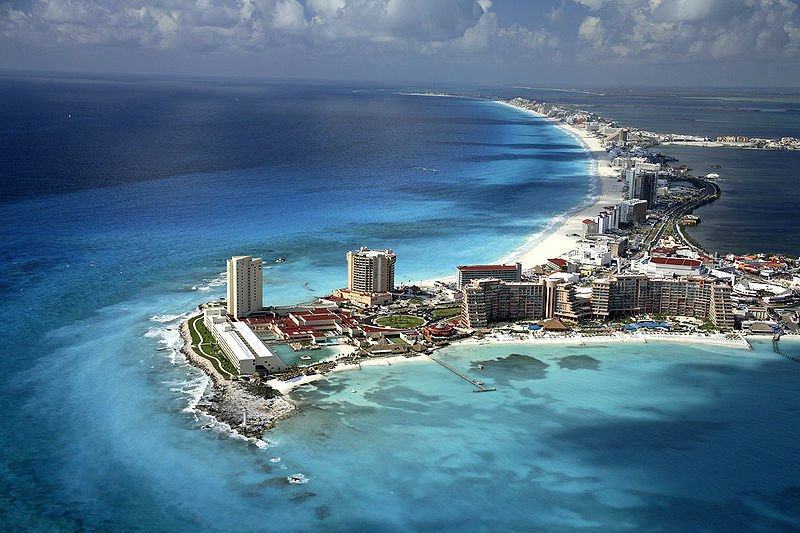 Thus cities like Cancun, Playa del Carmen, Tulum, Maya Riviera are an hour different (earlier) than cities in the state of Yucatan, such as Chiché Itzá, Mérida, and Valladolid. This is significant for calculating travel times to Cancun Airport. Should I Buy or Bring Mexican Pesos (MXN) before traveling? There is absolutely no reason why you need to have pesos in hand upon arrival. Bring US$20 or $40 in cash in ten or more singles, two or three five dollar bills and maybe one or two ten dollar bills to pay for anything that you need at hand in the airport upon arrival. Get Mexican pesos on arrival in the airport from an ATM. Should I Buy Traveler's Checks to Bring with Me? I definitely do not recommend using these. They cost you money, even if you do not pay for them when you get them from your bank. The exchange rate is always lower than cash. And Cash is always lower rate than an ATM exchange rate. Should I change money in the airport? These are not going to be located in easy vision upon arrival. See instructions below. DO NOT change money in the airport as this can entail large losses -- perhaps not so much in Mexico but certainly in places like the Amsterdam Schipol Airport! Should I withdraw money from an ATM machine once I arrive Mexico Airport? YES! Yes, yes, yes yes! This is the best way to local currency in Mexico and as a rule in any other country you travel to. Use a Bank Debit Card to withdraw local currency from an ATM machine in the airport before leaving for transportation. Should I Bring US dollars with Me? How Much? Yes, BUT only as an emergency back up in situations where you have no money and no access to an ATM. How much you should bring is discussed below. What is the best form of Money to travel with while in Mexico? ATM Bank Debit Card. The best exchange rates are through ATMs owned by national, established banks, such as Bancomer, Scotiabank, Banco Santander, HSBC, and Banamex. This seems also to be the case with traveling in Europe, where transaction fees are quite steep. Bank ATMs are available in key locations for travelers such as: Bus Stations and Airports and most grocery store chains. The Cancun Bus Station has a Bancomer and a Santander ATM. The Cancun international departure terminal has a Santander and a Banamex. The Mérida airport has at least three different ATMs. There are Santander ATMs in the ADO bus stations in Merida, Playa del Carmen, Tulum, Valladolid. Cozumel port and commercial zones have a "boat"-load of ATMs for all the cruises. ATM rates from no-name, generic ATMs that are located in stop-and-shop convenience stores, hotel lobbies, gambling halls, saloons and similar are not recommended. These will charge you more and give you less for your foreign currency than on the street cash exchange. Do not use your credit card at ATMs to get cash. The exchange rates are lower and your credit card company charges a foreign transaction fee of anywhere from 1% to 3% on top of the ATM fees. Save the money for your retirement fund instead. How do I get Mexican Pesos on Arrival? Arriving in Cancun. Upon arrival in the international arrivals you will go through luggage claim and customs. Follow the hallway past all the condo sellers and transportation venders. Exit the doors and then another set of doors to exit the building. Upon waling out of the terminal building you will see the horde of taxi drivers and hotel mules. Turn immediately to the left and walk down the sidewalk 10 yards to re-enter the building but this time you are going to be in the departure section of this International Terminal 3. Walk along the door side of the building until you find an ATM. If you have trouble ask anyone at the restaurant. Get cash here before traveling elsewhere. Arriving in Mérida. Upon exiting Customs continue past all the hordes of persons waiting for friends. Turn following the crowd toward the doors. Before exiting, when facing the entrance doors, turn toward your left. More or less directly across the hall from the escalators leading to international departures there are 2 ATMs. One of these is Santander. How much CASH money should I bring and in what form? I always recommend bringing a small amount of emergency cash, never travelers' checks. As a general rule of thumb bring about $100 to $400 US cash depending on your own personal finances and budget. This cash is for emergency use when you are running low on local currency and do not have quick, easy and FREE access to an ATM. By free, I mean you do not have to pay for an extra transportation cost to get to the ATM of your choice. Bring at least twenty dollars in single bills, four $5 bills, four $10 bills, and one twenty to total $100. If you double this cash in hand amount to $200, then increase the number of $20 dollar bills to five $20s and split the remainder in additional five and ten dollar bills. If you bring more cash in hand then bring this in $20 bills. What kinds of Out-of-Pocket Expenses Should I Calculate? OSEA Participants. 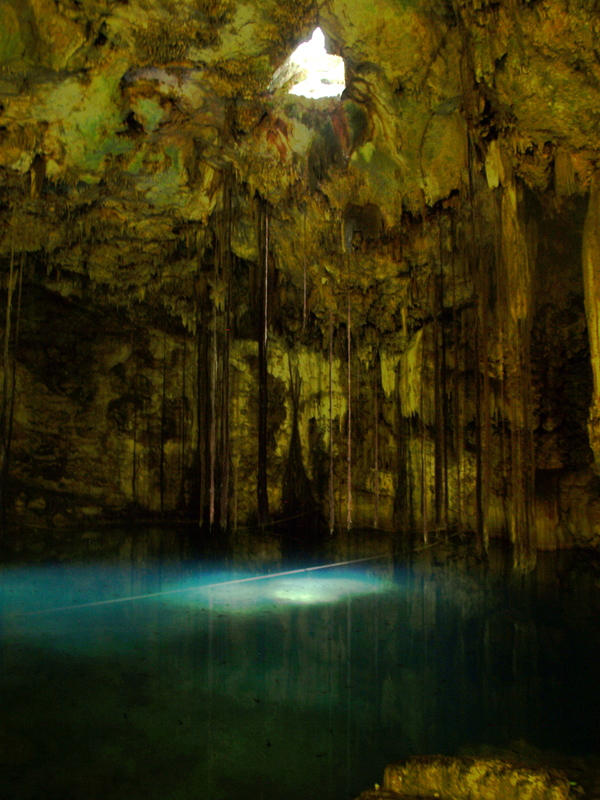 You can assume that travel during the program break can cost about $200 to $400 depending upon how many you travel with, how much you like eating at expensive restaurants and bars, how much and how often you want to pay for touritic recreational activities-- such as scuba diving, boat trips, cenote swimming, water skiing, etc. Traveling light and cheap, estimate $20 a night on hotel, $10-20 a day on food (depending on how whether you are going to go to tourist or local restaurants! ), and then add in your entertainment expenses. Addional Costs. Consider how much you may want to spend on gifts for yourself, friends, homestay family and family in USA. On site, you will have very little expenses during the main part of the program -- say at the most $50 for snacking, phone, short trips, etc. Also calculate that you will need to have an emergency cash box of about $50 for medical expenses, which you will be able to use for gifts at the end of the day. It is perfectly safe to bring a few hundred dollars with you and leave in your family homestay. It is suggested that you also bring a credit card if you have one, so that you may use in emergency or special circumstances for your travel before, after and during program break. Note however that credit cards charge an excessive 3%! international finance fee for purchases and a extra ATM withdrawal fee. BANKS. It is usually not convenient to open a bank account during your stay. You can receive wires from a major bank such as Bancomer. Most banks in the Yucatán and Caribbean coast change pesos at a standard rate, although less than the official rate and less than what is available in central Mexico. Change money at the México city airport if you fly through that city. Casa de Cambios can offer better rates, but necessarily. Additionally, if you have an American Express Card, there are offices in Cancun and Mérida and these provide the top exchange rate. AMEX offers other services such as: writing a personal check and having it cashed into pesos at going rate. AmEx is also very good if you lose your passport, money, etc and can provide great emergency services. Call AmEx for other benefits & services. In case you need additional funds under $500 US you can get money very easily via ATMs. If you need substantially more money, you can receive overnight wire money from $500 to $3,000 from western union or other international wire services. See below. Do not change money in any airport or hotel if you can avoid it. If you really must have local currency just change the bare minimal amount. Make sure you travel with cash and at least $100 in small change -- twenty $1 bills, four or six $5 bills, one $20, and the rest in $10 bills. You can change money in Pisté, but there are no casas de cambio and the rate is inferior to Mérida and Cancun. Cancun has the best exchange rates always. Note that the exchange rate posted in the window is not necessarily the actual rate that you will get!!! You must ALWAYS ask what is the actual real rate and if there is a commission charge. In Cancun, there are Casas de Cambios on Tulum Ave. near the Bus Station. Exit the bus station, turn left, cross the street -- Uxmal Av. -- and walk around the street past Sanborn's restaurant toward the main boulevard, that is Tulum Av. See Cancun Map . If you have time, there are other casa de cambios all along that strip from the diner to the next block (about 1/4 mile) as well as banks that may or may not have a competitive rate. Compare prices if you wish. This by the way is the tourist center of Cancun City and you will find interesting clothing stores, the FAMA bookstore, and restaurants. We do not suggest eating at these for the food is only for the tourist show and experience; they are expensive. 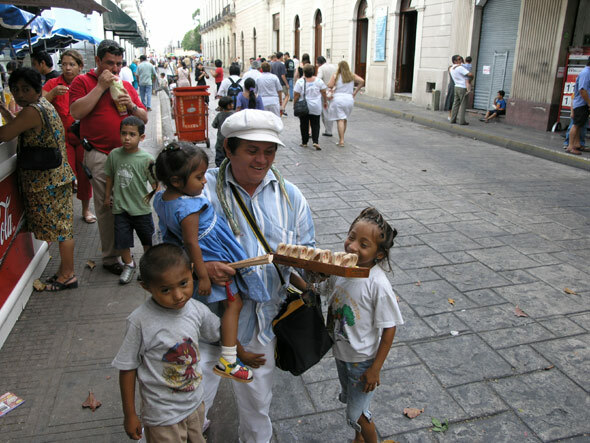 In Mérida there are Casas de Cambio on Calle 60 starting in the 3rd block north of the downtown (after Calle 59), also on 59 entre [between] 60 and 62. These are easy access, good rates, and quick. The very best exchange rates in Mérida are at one of two stalls in the Hotel Fiesta Americana. Sometimes the American Express or AmEx has a superior rate, sometimes not, but AmEx has limited hours and lines whereas the others are almost always rapid service and open till 9pm. The American Express office is on Paseo de Montejo just north of downtown. In Merida AIRPORT. If you arrive in Merida airport on a day other than when we pick you up, then just change money to get the taxi; change $15 US. The taxi ride should not be more than 180 to 250 pesos to get to the center of town. The public bus would be 4 pesos (you may have to wait 20-30 minutes for the public bus, but this entails significant savings). In Cancun AIRPORT.you need not change money. You can use US $$ to buy your ADO bus ticket. This should be US$4. We recommend that you bring sufficient cash for your needs. Do not buy traveler's checks unless you really feel that the need for the security of the check. Cash gets you much better exchange rate, thus you will lose money buying the check and then cashing it. We also use our ATM cards for getting cash in pesos. The machine charge is about $5.00 but this is safe, quick and secure. You can withdraw up to $7000 pesos from Bancomer at Chichen Itza. Other banks have other lower maximum limits on ATM cards. You also need to check the limits of your credit card, ATM card, or bank check card. In Merida, the ATMs are located on 63 between 60 and 64; also along 60 and 58 streets. In Pisté there is a convenient ATM in the OXXO convenient store. However this ATM has a limit of 3000 pesos, which for me is low perhaps not for you! At Chichen Itza there are three other bank ATMS that have a higher withdrawal of 4 or 5000 pesos. Again, check your own banks' limits for ATM withdrawal. . Note that many large banks and credit card companies now charge a flat 3% surcharge on foreign transactions. This is really quite steep. Its highway robber in fact, without the highway. Wherease ATM withdrawals used to be absolutely the best way to have cash exchange of foreign currency, it might not be. Check your bank thoroughly on this point. If your bank does not charge you 3% only the fees for using an ATM, then this should be the way you operate in Mexico (and any other foreign destination). If you have a bank account and an ATM from CREDIT UNION then you are all the better off in terms of the international finance rates for ATMs and commercial purchases.